Why do we keep writing when our lives are frustrating and difficult? A friend called me tonight, bearing a load of sadness. She’d been talking to an acquaintance whose husband was cheating on her. For my friend, just hearing another person’s experience brought back her own memories of being betrayed. In a sense, two timelines intersected, two universes collided. My friend has never met her acquaintance’s wandering husband, and her own betrayal happened years ago. And yet that intersection uncorked long-stored emotions. I understand that. I understand not because my life has ever been marked by marital betrayal. But it has been marked with sadness for lost opportunities, lost relationships, lost time. Maybe that’s why my favorite movies are about situations that overcome impossibilities of time and space: Ladyhawke, The Lake House, and most recently, Source Code. One of my favorite books is an old, old and not-so-famous anthology: Science Fiction Adventures in Dimension. Before she was immersed, our campus minister talked of burying her, of raising her to life, of new beginnings. I want to believe that time can be redeemed. That there are no truly lost causes. That something can be dead and can live again. I believe in resurrection. 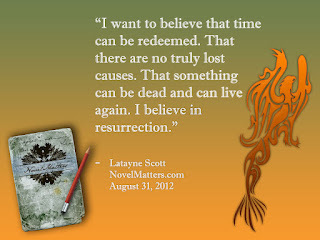 I believe I will be resurrected – and there is no more lost a cause than that. And that’s why I write. I believe that the lives of many people who’ve never met intersected over a table as two people tangled in their stories spoke to each other tonight. I believe that a young woman pictured the death of Jesus, pictured His rising, in her watery grave – though she was separated from His events by two thousand years. That’s what writing does too. In much the same way, I have the privilege of creating touchpoints with people I’ll never meet. But I yearn to create touchpoints of hope, not despair. I want to redeem time for them – lost time, time that can’t be relived but can be restored like locust-gnawed years. I want to join with Jesus, making all things new, of showing hope that overcomes the world. Well said, Latayne--right down to the part about time that "can be restored like locust-gnawed years." Beautifully put. I love that! I suspect you'll create a touchpoint with many kindred spirits today. Yes. I'm inspired. Thank you, Latayne. I am glad you write Latayne. You use words thoughtfully and say it so well. Beautiful, Latayne. So much to contemplate.
" ... making all things new, of showing hope that overcomes the world." Not a bad use of time. Karen, Suzie, Cherry, Nicole -- you want to know about grace? This column was begun at nine in the evening as I sat before a blank screen with a blank mind. The first friend called, I began to write the column; the second one called and I went to the baptism. Then, then, it was full circle; then, then it could be written. Sharon and Katy, I love you dearly and miss you so much. Thank you for your support. You really connected with me when you mentioned how writing brings touchpoints with others in difficult situations. I want to be that kind of writer who creates touchpoints with people I'll never meet yet impact their lives. Great post that encourages me to continue writing. "I want to believe that time can be redeemed. That there are no truly lost causes." Amen, amen to that. This was a touchpoint for me. Gracias! Kat, I think that just the recognition of how such touchpoints "work" is the first step to good writing. And Samantha, the more impossible things seem in my life, the greater the opportunity for faith.